As I mentioned in my review of The Stars Are Legion last year, Kameron Hurley originally came to my attention when God's War was nominated for the Nebula Award for best novel in 2012. I instantly fell in love with that book, and the same goes for the two sequels, Infidel and Rapture. Dark, violent, complex, touching, compelling, populated with flawed but endearing and unforgettable characters, I felt that the Bel Dame Apocrypha could well be the very best speculative fiction series of the new millennium. And a few years later, I still believe this. At the top of her game, I claimed that Kameron Hurley ranked among the best SFF writers out there. I couldn't wait to see what the future had in store for her. I went so far as to say that Hurley had now joined my short list of speculative fiction "must read" authors. In the following months, something quite unexpected happened. Kameron Hurley gradually became known more for her blog posts, genre-related articles, or essays, and not necessarily for her novels. Nothing wrong with that, of course. She also became somewhat of a poster girl for the online SJW SFF clique. Which is why, in the end, I was so reticent to read The Mirror Empire, the first installment in The Worldbreaker Saga. Yes, I am aware that I've just said that Hurley was now part of my "must read" authors and I couldn't wait to sink my teeth into whatever she would publish next. Problem is, the advance praise for that book scared me. You see, all those reviews went on and on about what Hurley was trying to do. Not much was being said about the story itself. It was nice to learn that she had not just subverted all those fantasy tropes and clichés. She kicked them in the balls, kicked them while they were down, set fire to them, and then pissed all over them. Good for her. But I'm a plot kind of guy. Always have been and always will be. I wanted to know just how good the story was. But all I was reading about had to do with gender role reversal and gender non-conformity, yada yada yada. Kameron Hurley was being applauded for coming up with something totally different. But not, as far as I could tell, for writing an awesome and captivating story. Understandably, The Mirror Empire was an extremely divisive work among readers when it was released. Still is to this day. And although I've bought both the first volume and Empire Ascendant, I'm still quite reticent to read these books. I'll get to them at some point, no doubt about it, but I'm in no hurry to do so. Then the announcement came that Hurley's The Stars Are Legion, a space opera stand-alone novel featuring a female-only cast, would be published in 2017. Again, this was acclaimed by the SJW clique and the book, more than a year prior to its release, received a lot of coverage from those sources. I had the same reservations about that book, yet I resolved to give it a shot. This was a single, self-contained science fiction tale, and I wanted to review it. Overall, it turned out to be a good read. However, it suffered from too many shortcomings to even come close to the greatness that made the Bel Dame Apocrypha such an amazing series. The violence, the anger, the general badass vibe; it was all there. Unfortunately, the depth, the originality, and the superior characterization were absent, and The Stars Are Legion was a much weaker work for that. 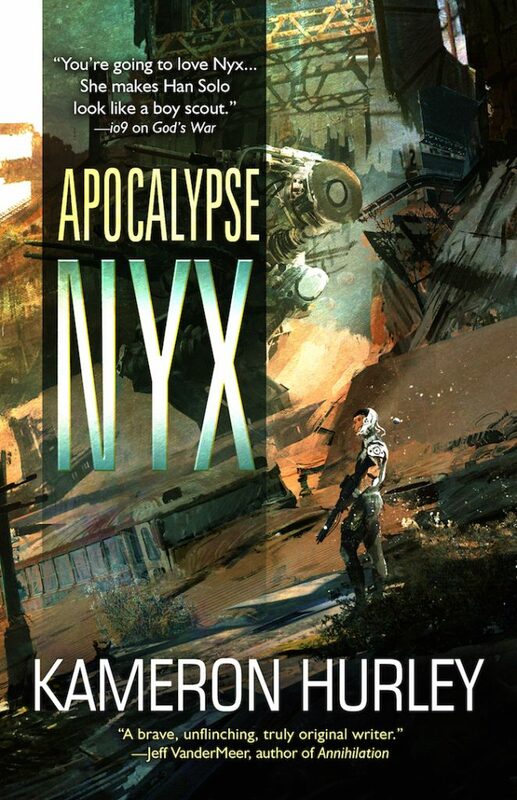 But when I received an email offering me an early read of Apocalypse Nyx, I jumped for joy! Four of the five novellas that comprise this book were initially written and published for Kameron Hurley's Patreon supporters and will now be widely available for the first time, thanks to this nice Tachyon edition. It was pure delight to be reunited with Nyx and Rhys, if only for the span of five short fiction pieces. This collection recaptures everything that made the Bel Dame Apocrypha such a memorable read and is a must for anyone who's a fan of the original series. Apocalypse Nyx is also the perfect opportunity for newcomers to get a feel for the universe and its protagonists for the first time. It may lack the full depth of the trilogy, but it certainly introduces Nyx with a bang! The worldbuilding that serves as the backdrop for the Bel Dame Apocrypha was top notch. Hurley's vision was quite unique and the world she created came alive in a manner that is seldom seen. Islam has taken to the stars, but the religion has evolved over the centuries. The author's narrative created a vivid imagery that made the ravaged world leap off the pages. Add to that some strange insectile technology and magic, as well as some cool concepts such as the bel dames and alien gene pirates, and you realized that Kameron Hurley has created something truly special. If you are one of those jaded science-fiction reader believing to have seen it all, think again. The novella format prevents elaboration on most of the ideas introduced in the series, so in that regard existing readers might get a bit more out of each tale than newcomers. And yet, each story is written in a way that makes them accessible even if you have not read the trilogy. In a war-torn and contaminated world, you cannot expect goodie-two-shoes men and women. The product of a brutal and unforgiving environment, the characters are what you expect them to be. Hurley's characterization is similar to that of authors such as Joe Abercrombie, Richard Morgan, and George R. R. Martin. Forget black-and-white protagonists, for every single protagonist has shades of grey. Hence, not for the faint-hearted, but oh so satisfying. As a matter of course, Nyx takes center stage in every novella. Rhys, her contracted magician, plays an important role in most of them. The supporting cast is made up of interesting characters such as Anneke, Taite, and more. Going through these novellas made me want to abandon my scheduled reads and reread the Bel Dame Apocrypha. Yes, it is that good! Although each novella acts as a stand-alone vignette and is episodic in nature, the five stories form a whole that works quite well. Hence, even if Apocalypse Nyx is a collection of five different stories, there are enough threads linking them together to create a work that stands well on its own. The rhythm throughout is fast-moving, making Apocalypse Nyx another page-turner. My only complaint would be that you reach the end too quickly, thoughroughly satisfied but begging for more. Here's to hoping that Kameron Hurley is planning additional Nyx stories, because I for one will be waiting in line to read whatever comes next for our favorite alcoholic bounty hunter! The author's prose is dark and brooding, the rhythm often balls-to-the-wall, yet Hurley nevertheless finds ways to hit you with touching moments that pack a powerful punch in terms of emotional impact. If the legendary Frank Herbert, Richard Morgan, and Joe Abercrombie had ever teamed up to write something together, the Bel Dame Apocrypha is the sort of creation they would have come up with. Indeed, the trilogy deserves the highest possible recommendation and I encourage you to give the first installment a shot. Brutal, uncompromising, brilliant, enthralling: That's God's War in a nutshell. But if you find yourself in need of a primer, so to speak, something that works as a great introduction to one of the most badass heroines in SFF history and to one of the best science fiction series of the new millennium thus far, then Apocalypse Nyx is just what the doctor ordered. I would like to thank Kameron Hurley for this chance to revisit these remarkable protagonists and their unforgettable setting. The genre needs more Nyx. I bought the Bel Dam series after I read about them from you Pat, and they are so good I can't believe the whole world is not talking about them. They would make great movies! Hurley's fantasy novels are also amazing, I just can't wait for the next chapter. However, the Stars are Legion was really disappointing. First of all, it was so similar to a comic concept by Jim Shooter, back in 1993 (https://en.wikipedia.org/wiki/Warriors_of_Plasm), that it should have a "based upon" comment in the credits. Secondly, the world and character building needed more, way more fleshing out in order to make us feel more interested and invested in them. But I digress. I'm so glad that we have now more stories with Nyx while we wait for the next Mirror Empire!